That would be a good way to work, yes It is worth making a mojo with the items that you keep in your locker and/or equipment bag as well however. I got hurt in a cheer accident my freshman year of college. It is now 3 years later and I joined a pro squad. We perform on concrete so im a little "mental" about things. Like, my head knows exactly how to to a backhandspring (backflip), but I cant seem to throw it, I get anxiety its so weird even though Ive done it so many times. I'm the flyer in pyramids too. I was very good in high school and in college before I got hurt. Same thing my head knows exactly what to do but my body just feels anxious and intimidated and ive become "sloppy" and when I need to twist out of my stunts, my body turns too early before I even leave their heands, I land crooked. Sorry if I dont make sense here but basically my body isnt doing what my head knows it should do. I practice my twist downs into a foam pit at the gym all the time and they are perfect. Its not the people lifting me either. Its me and Im so frustrated. So I guess I was wondering, should I get the following powders to help my situation? Victory, master, crown of success, st john the conqueror, queen elizabeth, and tranquility? I was thinking of mixing them up and sprinkeling the mix in my shoes before practice and performances. I like your mixture and would add one thing to it -- Crucible of Courage. The name kinda says it all, but this formula contains herbs and roots that increase one's bravery. I'm looking for suggestions, other then a mojo, for my son who plays football and wrestles. He's trying for college scholarship. Right now he's just average and has increased his training. He wants to be the 'dark horse' of the team this year. He's not allowed to wear any jewelry or anything like that and carrying a mojo would be very difficult for him. I am thinking of putting LM oils or powders in his shoes. Any suggestions of combinations to go with Crown of Success? Also should we do a honey jar for the schools he's interested in? Thank you St. Expedite for prayers answered! Sorry if this is in the wrong place. I wasn't sure where to post it so if it belongs somewhere else, feel fre to move it. I know there's a Mojo for losing weight, but I was wondering if there's a way to take it further? Is it possible to use Conjure to help build muscle mass? And if there is, is there a way to place this on someone else? I would work with Crown of Success, Crucible of Courage and Power products. 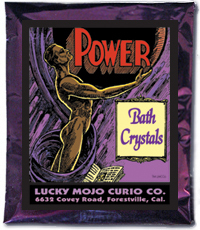 You can get the bath crystals of each of these products, mix them together, pray that whoever uses them will have success in weight lifting/bodybuidling, and add a pinch to the load of the laundry rinse water of his/her clothes. That will dress them for success. You can also wash the floor with the bath crystals dissolved in hot water. Or get the dressing oils and dab them inside the person's shoes, especially their athletic shoes. Pray as you go. in addition to MaryBee's excellent advice and suggested prayers, you may also want to consider using those in conjunction John the Conqueror products. A whole one oiled with Nature oil and hidden in the targer person's gym bag could pack quite a punch. Thanks guys. I will definitely try those. In addition to that, I was thinking of using the Blessing spell on the Blessing supplies page? Would that be helpful as well? What if I cast it in favor of another person? There's another issue I wanted to ask about. I've recently started taking martial-arts classes again. Besides the methods you guys have already mentioned, would petitioning St. Michael be a good idea? I assumed he would the St to go to as he is the leader of the armies of Heaven and patron of policemen. working with St. Michael in conjunction with your martial arts training (particularly if you are a policeman!) can work very well. Thanks for raising this topic. It is something I was wondering about too. I do Brazilian Jiujitsu and have my first tournament coming up. I wanted something to help me out and this thread helps out quite a bit. My son is a great baseball player and REALLY loves the game! He wants to play for his high school team next year and hopes to go farther. He's 13 and has been playing on competitive travel teams for the past four years and has been treated poorly by his coaches...it's been one problem after another and it has hurt his confidence in his ability. What can I do to help him? I need something for his success, confidence, and to make the "bad" coaches treat him well and give him more opportunity to shine. Crown of Success and John the Conqueror (the root and also oil, powder, mojo) would help him. 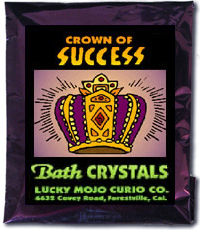 You could get a Crown of Success and/or John the Conqueror spell kit also. Can I buy him the mojo hand bags and give them to him? Can I just put them in his bag without him knowing? Sorry for my ignorance...I grew up in the South and heard my relatives talk about root doctors but I really don't know how to use it or how it works. Your thread has been merged into the longer thread on this topic. Please read from the beginning to see what has been discussed on this topic over the past couple of years. Now, to your specific question: If he will carry a mojo bag, you can certainly buy him one. You can also work on his behalf without him exactly knowing about it, by washing his clothes with a pinch of the relevant bath crystals in the laundry rinse water, or adding a dop of the appropriate oil to any hare-care products he may use. 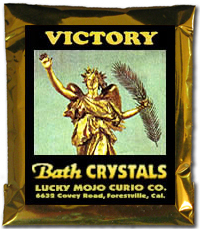 You can blend or mix oils with other oils and bath crystals with other bath crustals. If you are curious about any of the products, go to the section of the forum that deals with that type or form of product (oils, baths, ncense, etc.) and then look for the item bearing that name (e.g. Victory Oil Questions and answers). You can order these right here in the forum by clicking on the blue Add To Cart buttons. OK...I'll check these out and give them a try. Thanks! This is a bit long only to give background information. I actually have three specific questions which are indicated in the post. I wasn't too sure where to put this, as my query doesn't really match any of the categories, so please move the topic as appropriate. I regularly compete in fashion competitions. It's a little like a cross between a pageant (only because you have to actually appear on stage in the clothes) and Project Runway (as fashion is actually what is being judged, not so much looks). I compete mainly for the prize money (hence why I put this in the "money" category) and the promotion it gives my small business. The competitions are taken very seriously by most competitors, and winning can be tough. I put countless hours into the physical side of these competitions, and now I would like as much of a "spiritual" push as I possible can. I have a lot of LM products which I think could be useful (Queen Elizabeth root, QE powder, Look Me Over bath crystals/oil, the entire attraction range, Influence Oil, various money drawing oils/incenses/crystals, Blessing Oil, candles in most colours, John the Conqueror root, Victory Oil, Fast Luck Oil, Follow Me Boy Oil, VanVan Oil, Crown of Success Oil). I am planning on ordering lodestones, lodestone powder, Look Me Over incense/sachet powder, I Can/You Can't Oil, along with any other useful spiritual items. - A general honey jar for sweetening judges (QUESTION #1 - It is different judges for most competitions, and I will not know who they are, so is this inadvisable?....I was just wanting to generally "sweeten" my chances and was thinking of writing "all judges in all competitions will favour me"). - Setting a lodestone to draw in my goal (I plan on winning at least $100,000 in total in these competitions within five years....some competitions actually have $100,000 prizes!!!). - Smudging my outfits (carefully) with incenses (Look Me Over, I Can You Can't, Victory Oil) and storing the outfits underneath the altar before competitions. - Wearing powders and incenses at the competion (QUESTION #2 - There are so many products I can think of! Which LM ones would you go with?) and dusting my entry forms with the powders. - Using competition advertising flyers on my altar, and using them to help "draw in" a victory at that specific competition. QUESTION #3 - I was wondering if anyone had any suggestions on what could help me. Are there any other rituals/products you would perform/use? Attraction, Victory, Wealthy Way, Look Me Over, and Influence would be my choices. Since, as you say, the judges are different every time, I don't know if a honey jar would be advisable. My daughter is trying out for the soccer team at her school in 2 weeks. Next week is the open gym. SHe has been playing soccer since age 4. She played travel for the last 4 years. Her current coach is the schools jv coach but that doesn't mean anything. He is very competitive and picks only the best. If this were just a girl team she would have no problem. Unfortunately in the middle school, it is boys and girls and they mostly pick boys. There are 40 spots total between the boys and the girls and there are about 120 kids trying out. She wants to make the team so bad. Is there anything that will help her stand out and do her best? I know I do not have time to order anything so please tell me what I can do/use to help her make the team with what I have. I have crown of sucess oil, look me over oil, love me oil, Stay with me , stop gossip , influence oil and waiting for attraction oil to come in. Can I mix the influence, crown of sucess and look me over oil and attraction (if it comes in in time) in a spray bottle and spray her cleats? Should I also spray her hair in the morning(unfortunatley tryouts are after school- I don't know how long the affects will work). Should I light a candle or dress her with the oils daily when tryouts start or start now. I heard of making a mojo bag but again with this short notice(just found out yesterday) I don't have much time. Plus she will not be allowed to wear anything on her at tryouts so a charm or mojo bag is out unless I slip it in her bag. If there are anyother ideas, I am open. Just has to be with stuff I already have as it takes too long for the order to ship. As a fellow HS soccer player I wish her the best luck! I would use crown of success put it on the crown of her head to be successful. take some of the oil crown of success, influence and look me over and put it on her socks and a little on the shoe strings dont put it on the bottom of the shoes due to slipping. In two days starts a new moon I would start now burning white candles dressed with the oil with the couches name on it praying to influence him to pick her. you can start a honey jar on him, or if not enough time wrap his name up with the petition and stick it into your sugar bowl to sweeten him to her and pick her as a player. Have LM set a crown of success candle about 5 to 6 days before the try outs so it is burning when she plays and after she plays and supports her and them picking her. Best of luck! I am sorry to say that this would not be an effective spell. Tiny candles that burn for a few minutes and unable to hold a petition on them. There's not enough time to take this petition to the spirit world. I only use birthday candles (and I rarely do this) if it is just to back up other candle work or as a fortifier after a spell. BUT only if I have no other candles and it is an emergency. You're trying too many quick substitutes. That's not a very good foundation for effective spellwork. Ok I will get a white vigil class candle or st.expedit, dress it with crown of success, attraction and influence, carve the petition kn top and and light that. I use the small birthday candles for my honey jars.i saw it in the forum. For the sugar with the petition, I was asking if she had to use the sugar? Hey all. My mother works for a cosmetic store and they want her to model. She wants to know if Look Me Over can make her look younger. Can this make her look significantly younger or just youthful, or its not used for that? Look me over will make people to look at her with interest, look me over with bewitching can give a mystery about her that others will want. Not sure if one of these will make her physically look younger but both mentioned will increase her magnetism and those who are drawn to her. Ok so for an update, here is what I have done so far. This week is open gym and tryouts start on Monday so I have a little more time. I did dress her head with the crown of sucess the first day and the influence, crown of sucess and look me over on her shoes on Monday. She said she did we but she is going to wear different sneakers since it is indoors and the ones she had were slippery(not from oil- I listened). The first day she said was great. The second day a recent knee injury bothered her but she didn't let it stop her. The JV coach was not there but the Varsity coach did recognize her and asked if her brother was Travis. She said yes. His son and my son were on travel soccer together and we were close. I haven't really had a conversation or seen the guy in over 2 1/2 years so this is good. I have been burning white candles since you told me to. The last one went out this AM. When I get home, I will light a red candle to St. Expedite, with the influence,look me over and crown of sucess and carve he names and petition in the top since today is the best day for St. Expedite. I will keep burning the red candles until tryouts are over and she makes the team. I also folded the coaches names and petitions in a sugar bowl and will feed it to her over the next 2 weeks. Tribaby, sounds like good work. I wish you luck. I wanted to try my luck to enter a local pageant competition. Is it sufficient to use crown of success to win the title? That would be a good choice. I would also add Victory and, since you are competing against rivals with the same goal as yours, add I Can You Can't to the mix. Thank you for your suggestion. But, i dont think i have enough time to purchase the other two oils. The competition will be held on 3rd June. I only have Crown Of Success oil right now. What should i do? Thank you for your suggestion. I did the pageantry yesterday and I did put the COS oil but maybe I'm out of luck, I didnt manage to get any place. It's ok Miss Aida. Maybe it's just not meant to be a winner. Hi all - I dont know where to ask this since I havent found anything regarding athletic success on the forum. I am a Brazilian Jiu Jitsu competitor and MMA fighter and have been looking for something specific to making me successful in competition (other than all of the hard work with training etc haha). I have done success spells before, but would love to know if there are any spells out there that cater specifically to success in athletic competition. I found the exact forum thread you need! Read through the posts here; you'll find lots of ideas to increase your personal power and strength as you fight. Good luck! Thank you Sister Jean! This is perfect Appreciate the help! Is this the right place to ask what I might do to increase my edge in some State Fair cooking competitions? I saw was introduced to this website by a friend and it's really interesting. I was raised to believe in 1 thing but this site really spoke to me and opened my mind. I want to order some stuff from here but I need to order the right ones. My daughter wants to change her name. I really am trying my best as a single mother and it was one of her wishes for her birthday but the St.Expedite spell didn't work so I could purchase her other stuff so I promised I would let her change her name. The people at the court are SUPER RUDE! and sometimes they decline the names she wants the name Princess. I saw catherine yronwode spoke about the 5 finger grass, should I carry it with me while going to the court? And use the 5 finger grass oil (put olive oil on the grass) (i can't purchase the oil from lucky mojo right now because I need this fast) as a lotion? I need to register her for school so I have to get her identification card redone since she will have a different name and this thing takes weeks would the 5 finger grass help me when I ask a worker at the court if it can be done in 3 days? Since her name will be something else, for the Crown of Success spell dealing with the brown paper in shoe do I need to put her new name or her birth name? Or for any spell would I put her new name? Since I might be a little late in registering her for school can I put the Five Finger Grass herb in my pocket while begging them to let her be a student there? In general, I think you're on the right track with the Five Finger Grass. It's often used to get people to grant you favors, so I believe it could help in court and with her school. But don't push your luck and register her too late for school, or expect this herb to achieve what would normally take a long court process in three days. I think the oils you have put together for your daughter's races are good, but I wouldn't recommend putting loose herbs in her bra. I think you're right that it would be itchy. You could fold them into a paper packet and put that in her bra instead. 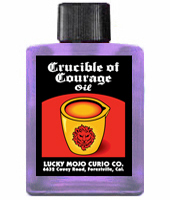 Lucky Mojo oils are safe for skin and hair, just don't use them internally or on any sensitive areas. Welcome to the Lucky Mojo Forum. We certainly do not wish to have you overthrow your former beliefs, but we represent a long-standing tradition of folk magic, and are always here to help serve those who follow that tradition. You posted in the area about school admissions, but you seem to actually want advice about a court case and an athletic event victory. I am splitting this post and moving it into the competitive sports spells area. When working a spell, i use the person's current and full legal name. And, yes, carrying Five Finger Grass in your pocket is fine. After you make (or order) that blend, use it to dress her calves. Set a Victory candle (that is, a small candle dressed with Victory Oil) the night before the race, and pray for her success. You guys are the best. Sorry about that I didn't know. For court I'll carry the 5 finger grass in my pocket tomorrow and I'll mix olive oil with the 5 finger grass and use it as the lotion and I'll ask of they can please help me within 3 days. Use the new name under the spell? Ok.
She has weird skin so for the track and field event I'll mix john the conqueror oil, i can, you can't oil, power oil and victory oil and put into her regular lotion. And put the rest of oils into her perfume to spray on her clothes but I'll cleanse the washing machine with florida water before washing. Wash her clothes with king solomon bath crystals mixed with out detergent. Any color candle? You guys sell them on the site? Wow. That is a mother's love and a root doctor's wisdom, all rolled into one. Thank you so much for posting that. You will have helped many others who come by and read this forum in months and years to come. THANK YOU. This is great how can I meet you to thank you? I owe you for this absolutely amazing. Bless you. I did research on these and you are truely an angel sent the lemon and lime cuts odor which is an amazing idea. I'll mix the crown of success oil with the victory oil great idea. Are you guys sure this will work or what if something goes wrong what do I do? As in life, nothing is a 100% guarantee, so we can't say we are absolutely sure it will work. However, have you been given some GREAT ideas! YES you have! Now it's up to you to put them into practice and have faith in your work. Good luck! I am not sure if I am under the right one but I would like to ask if I visit the store would I be able to find the items I added to cart or do I have to wait? Can I wash my clothing normally in my detergent and rinse in a mix of king solomon bath crystals and crown of success with my fabric softener? I switch up my detergents for different scents so can I use the mix of both together? Are you asking if you can pick up your order at the store that you purchased online? You would have to call the store to ask that question, they would have your order know where it is in being processed etc. Yes you can do that with the bath. Actually take the bath and save a cup of the water and add it to the rinse cycle of the washing machine. You can mix the two baths that is a common mix together. I am not sure, you will have to call the store and ask. Items may not be in stock at the moment you order or they are busy processing other orders. Commanding is to make people do what you want and five finger grass helps with all things you hands can do ( your work) and luck. You mean favors like someone to help you out? I would not use commanding to get assistance unless I have to force the person. Hope this is the right thead for this as I saw one previous reply with a similar situation. I don't know if you guys keep past orders once they are fulfilled, I was order number 0108762, all those things on there. My situation right now is I have a physical test for military coming up in two days, which is this Thursday. I had been training myself in the past couple months, but it seems just not enough. I am 26 now and my metabolism had slow down so I have a "bubble" of fat in my belly. I tried to change my diet, but it doesn't work and it is not going away. The physical test have four components, waist measurement, push ups, sit ups, and a 1.5 miles run. To pass, I need at least 34-35 inches of waist, 45+ push ups, 50+ sit ups, and a 11-12 minute run time. I am a nervous wreck about this right now, if I fail this test it would be my third failure and it would mean the end of my military career. So I'm turning to the powders I brought from LM as a final resort. Based on what I had brought, I'm planning to use a mixture of Crown of Success, Good Luck, Healing, Master, Protection, and Jupiter (the planet of luck). It is all I have at the moment. I'm planning to put them in my sneakers that I will be wearing to take the test, dust my hand, and the score sheet that I am responsible to print out. Healing and Protection to prevent and repair any possible muscle tears and injuries because I will be pushing my body to the breaking point. I really wish I could pass, and these powders are just here for good luck since they are not guaranteed to bring a difference. There is no other way right now. Do you guys have anymore suggestions in addition to everything I said? Well, magic cannot make a silk purse out of a sow's ear, and while it can boost your edge against competitors, it is not intended to change the rules of scoring. So you will have to hope you do better than you have ever done. you will have to call upon reserves of strength and stamina you have not touched before. To what you named, and knowing what you ordered, i would also add Influence powders, to impress the test-staff. Normally in a situation like this, the person being tested would carry a small John the Conqueror root, but that is not going to be possible, givn the brief time remaining. Among Catholics, Saint Sebastian is the traditional saint of athletes and Saint Michael the patron of the military. Hermes is the Greek god of athletes and Ares the Greek god of the military. Mercury and Mars would be the corresponding Roman Gods. I am sure that each culture has such spirits or deific figures who will assist. My husband suggested The Monkey King (a literary character, perhaps, but if taken as deific factuality, a being of great spiritual power and athletic prowess). Hmm, influence to impress the test staff, how does that work? The scenario I could think right now is them being in awe with my ability and motivates me, but that usually happens anyways. and yes, I do know The Monkey King, I grew up reading Journey to the West. The monkey is couragous, he dared to challenge even the toughest army from the heavens and Emperor Jade, also the Budda, but he taught the monkey a lesson.